Citrullinaemia is successfully treated in India. A four year old boy Rishi suffering from Citrullinaemia was successfully treated with a complex liver transplant procedure in India. His mental and physical growth was retarded by Citrullinaemia a condition which is rare in the world and seen in one only about 60,000 children across the globe. Citrullinaemia is characterized by a deficiency of enzyme ASS1 in the liver, which metabolises protein. Rishi’s Father Shirish donated a portion of liver to perform the liver transplant. According to Indian law only blood relation can donate their organ. To stop illegal organ transplant, Indian Government has come up with a 1994 law that criminalizes organ sales. The Human Organs Transplant Act, 1994 has laid down certain rules and regulations that are to be followed while conducting organ transplant. “The child was unable to metabolise proteins ingested in the daily diet. Rishi suffered from mental slowness, recurrent vomiting, poor feeding and chest and intestinal infections. For four years, the child survived on a low protein diet with medicines and imported essential amino acids formulae which cost Rs 30,000 per month,” Dr A S Soin, chief surgeon at the Medanta Liver Institute in Gurgaon said. “After the transplant, the child is now on a normal diet and mentally sharper than before. For the first time in his life, after transplant, he drank milk and ate a chocolate”, said Dr Neelam Mohan, director, paediatric hepatology. Doctors said that there is no drug therapy which could be used for this disorder. Different medical tourism agencies/ facilitators joined hands for the development of Indian Medical Tourism both traditional (Unani, Aurvedic) and regular. More than 70 medical facilitators were gathered in Okhla, New Delhi on August 21, 2013 and discussed on the topic of “Future of Medical Facilitators in India”. This general discussion was called by Al-Shifa Medico Facilitators a partner entity of OAS EXIM Pvt. Ltd., Abdul al-Hafiz Group, Marlin Safe Med Journey and Al-Rahman Medical Tourism Pvt. Ltd.
Mr. Obaid-ul-Allah (MD of OAS EXIM Pvt. Ltd.) enlightening the need of Al-Shifa, said it would provide the shelter for both patients as well as facilitators and control the cost of surgical procedure. He further said that their goals are to provide high level quality care within affordable price that’s why they will only deal with those hospitals which fulfill JCI and NABH criteria. Mr. Abdul al-Hafiz (Abdul al-Hafiz Group) also addressed the gathering and described the nature of work of Al-Shifa. 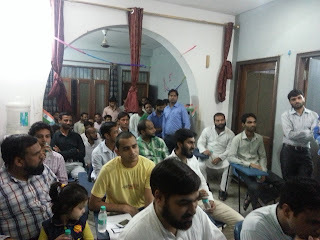 He said that few medical tourism agencies were not upto the marks and exploiting the patients. I think Al-Shifa is real eye-opener for many medical facilitators and guides them to deal with foreign patients. Mr. Md. 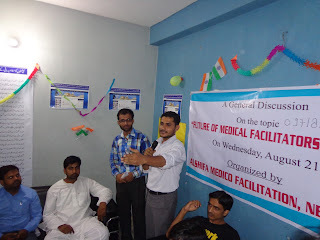 Afzal Siddiqui (Marlin Safe Med Journey) explained the objective and goal of Indian Council of Medical Facilitators and Interpreters (ICMFI). He said that all these efforts to protect the reputation of Indian Medical tourism from disreputable hospitals and healthcare providers which may not have the same level of quality healthcare and standards. ICMFI makes us able to demonstrate a depth of Indian options many hadn’t seen before. Participants of this programme actively shared their views and nominated a group of ten people to tackle their concerns. In this function, Mr. Safder Imam, Mr. Abdullah, Mr. Imdad Rabbani, Mr. Shifa Mr. Ateeq and Mr. Afaq along with 70 medical facilitators were present and assured to strengthen the Al-Shifa.